Is That a Carrot, or is Chef Neal Fraser Happy to See Me? And oh how delighted I was to find that it was actually a veggie rather than some overly processed soy turd! Sure the menu clearly stated “veggie carrot dog” but I have to admit, I wasn’t expecting a giant carrot in a bun. Nor would I think a giant carrot in a bun would be tasty, but I was most pleasantly surprised. But how do they do it? 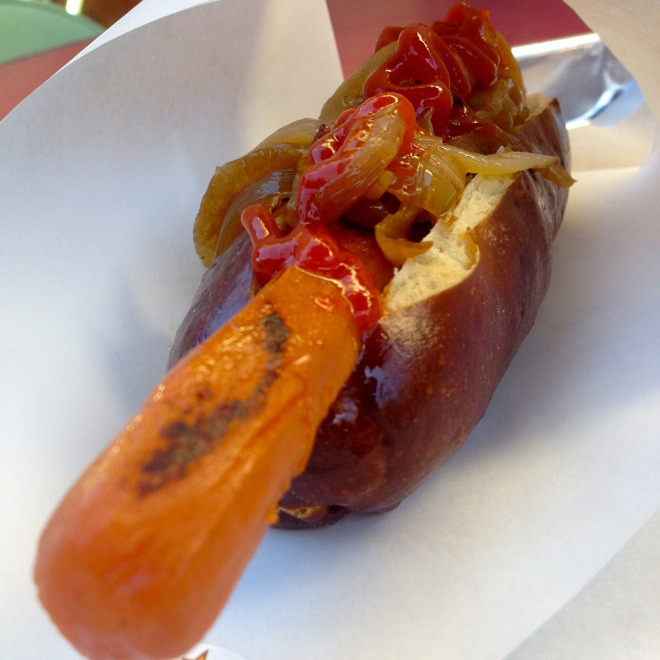 A Fritzi Dog rep tells me that their veggie dogs (and yes, they’re 100% vegan) start with huge organic carrots that are whittled down to a diameter of 27mm and marinated in a blend of 35 spices. They are then cooked sous vide overnight at 190°F, a process that “breaks down the cell walls [of the] carrots, but keeps them from getting mushy.” Then, they are cooked on the grill to order, giving a little snap and some nice browning on the outside. I tried mine on a pretzel roll with grilled onions and Sriracha ketchup (those that know me would expect no less), and devoured it happily. So nice to find a veggie dog actually made from a veggie!